What is the meaning of life? It is a question that has intrigued the great philosophers--and has been hilariously lampooned by Monty Python. Indeed, the whole idea strikes many of us as vaguely pompous, a little absurd. 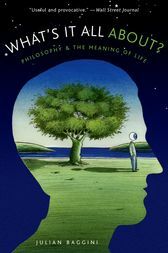 Is there one profound and mysterious meaning to life, a single ultimate purpose behind human existence?In What's It All About?, Julian Baggini says no, there is no single meaning. Instead, Baggini argues meaning can be found in a variety of ways, in this life. He succinctly breaks down six answers people commonly suggest when considering what life is all about--helping others, serving humanity, being happy, becoming successful, enjoying each day as if it were your last, and "freeing your mind." By reducing the vague, mysterious question of meaning to a series of more specific (if thoroughly unmysterious) questions about what gives life purpose and value, he shows that the quest for meaning can be personal, empowering, and uplifting. If the meaning of life is not a mystery, if leading meaningful lives is within the power of us all, then we can look around us and see the many ways in which life can have purpose. We can see the value of happiness while accepting it is not everything. We can see the value of success, without interpreting that too narrowly. We can see the value of seizing the day as well as helping others lead meaningful lives. We can recognize the value of love, as perhaps the most powerful motivator of all.Illustrating his argument with the thoughts of many of the great philosophers and examples drawn from everyday life, Baggini convincingly shows that the search for meaning is personal and within the power of each of us to find. Title: What's It All About? Julian Baggini is the founding editor of The Philosopher's Magazine. He writes regularly for publications such as the Guardian, Independent, and The Times Educational Supplement, and is a regular guest on BBC radio. He lives in the U.K.